Death in Paradise : Who is Josephine Jobert ? Meet the actress who plays Sergeant Florence in the BBC hit series Death in Paradise. 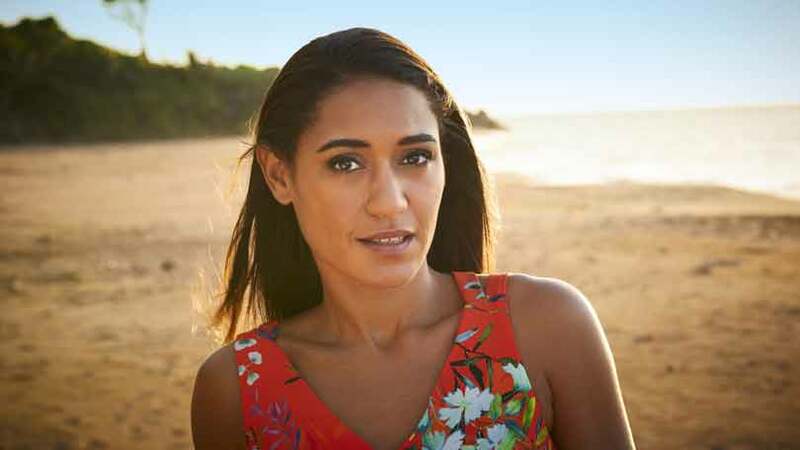 French actress « sweet » Josephine Jobert, is back as Sergeant Florence Cassel in the new series of Death In Paradise. Ahead of this evening’s latest mystery – the death of a hotel billionaire’s fiancee falls from a balcony the day before her lavish wedding – we learn a little more about the TV star. Why do you think Death in Paradise has become such a big hit ? It’s a family show. It’s not violent. There’s no blood. There are so many series that I like to watch, but sometimes I’m like, ‘It’s too violent’. People beating each other, saying bad words, you have blood – it’s very, very dark. And with Death In Paradise, you have the British sense of humour. This was your first English langauge role, wasn’t it ? Yeah, this was my first time acting in English. Three years ago, I was terrified, but very excited. The lead actress, it was Sara Martins, she left the show and I was taking her place, so I was afraid because everybody’s looking at you like, ‘OK, so let’s see what you can do’. Everybody’s judging you in a way, but the crew is fantastic. Learning my lines in French, it’s OK, I can learn pages and pages the day before, but in English you have to think about the accent. I just want people to understand what I’m saying, the rhythm, the stress on the words, you know? But now it’s my third year and I’m more comfortable and more confident. You must find it tough to leave the island of Guadeloupe when filming ends ? Yes. It [the shoot], it’s a very long time, almost six months. It feels like we’re a little family. We don’t have the chance to go back home at night and see our family so, yeah, you get used to it. You make friends over there, so when you go back to Paris, it’s very different. I like Paris, but it’s a very stressful city. I prefer London. You must know the island very well by now ? Yeah. It’s a small island. There’s plenty of things to do and to see, but during the weekend I just stay at home because I have a very nice villa with an amazing view. I’m not a party girl. I don’t drink. So during the weekends, I just stay home, learn my lines. My villa is my favourite place – and the gym. I go to the gym four times a week just to stay in good shape because I’m wearing lots of short shorts. That’s true. Her mother is my father’s sister and my father is white, my mother is black so that’s why we don’t look the same. I don’t know her very well. When we were children, we spent a lot of time together, but then I moved to Montreal when I was 12 for eight years with my mother and stepfather and when I came back to Paris, she was in London, already working a lot. I’m very proud of her. Would you like to follow suit and play a Bond girl ? You know it’s funny you say that because it’s one of my goals. Everyone around me tells me, ‘You’d be a good James Bond girl’. Why not? I’ll tell my English agent! There has been a lot in the press about lack of diversity in the industry. Have you encountered this ? Yeah, in France especially, it’s really difficult for black women and even more for mixed race women because they’re too white or too black. It’s not easy. That’s what I’m very proud of with Death In Paradise, that we have so many black actors. In France, it’s very, very difficult and nobody talks about it. It’s taboo. And lots of actors suffer because of that. Death in Paradise is back for an eighth series! What can we expect this time round ? Where do we find Florence at the beginning of the series ? Has anything changed since we last saw her ? How long have they been together ? What does Patrice think about her job ? What is the relationship like between Florence and Jack ? They seem to really get on and work well together. Can you tell us anything about the cases that feature this series ? Did you have a favourite episode to film ? You’re no stranger to the Caribbean sunshine. What’s it like filming in such a beautiful place in the world ? Do you have any favourite moments from set that you can share with us ? What are you most looking forward to the audience seeing this series ? Who is Florence Cassell ? Twenty seven year-old Florence Cassell has risen to the rank of Detective Sergeant pretty fast for someone still so young. But that’s because Florence is incredibly good at what she does. She’s dedicated, focused and has a great nose for sniffing out those with a guilty conscience. In short, she makes an excellent detective. Having grown up in a house full of men (she has five older domineering brothers) she learnt from a young age that to stand out she had to learn to be assertive, to be strong-minded and, above all, to not be a pushover. And growing up in this environment explains why Florence is so good at spotting when someone is lying or hiding something. It’s because she’s seen it all before with her rascal brothers. But aside from being such a good police officer, Florence is friendly, charming with a winningly mischievous sense of humour – qualities which have endeared her to Humphrey, for whom she has become a close friend as well as a valued colleague and someone he turns to for guidance as he navigates his love life and starts dating Martha. Who is Joséphine Jobert ? Originally born in Paris, Joséphine moved to Montreal at the age of 12 where she learned acting, dancing and singing, eventually returning to France to pursue an acting career. She comes from a family of artists. Her mother is Véronique Rouveyrollis, a photographer, musician, writer, performer and director and her father, Charles Jobert, is a director of photography. She is also cousin to Elsa Lunghini and Eva Green. She gained notoriety playing Amel in the popular youth show Saint-Ex, nos Années Pension in 2008, and enjoyed 15 weeks in the French pop charts with a song from the show, which Joséphine sang. Since then, she has continued her success playing long term character Alice Watson in Lightning which won the award for Best Youth Fiction Series at the TV Festival of La Rochelle and is one of France’s most widely exported series. She then landed the part of Roxanne in the popular French soap opera, Sous le Soleil de Saint-Tropez (2013-2014). She also appeared in The Judge Is A Woman, Cut!, Paroles and will feature in the next series of Villa Kariybes. She joined the cast of Death In Paradise for the fourth series, in January 2015. Death In Paradise series 8 airs Thursdays at 9pm on BBC One. Missed an episode? Catch up on BT TV via the BBC iplayer app.